When we started out in the house, the front bathroom was... like everything else... white. One thing we love about this house are the bathrooms - they are both generous in size for Midtown houses and in good shape. This front one has a large linen closet that is very (verry) deep (to the right as you walk in) and we've turned the bottom in to a little cat apartment for Tyson. This first picture is the realtor's picture and you can tell they used a wide lens because I can't seem to get that much of the bathroom in my picture and I stand against the hall wall! What we loved about the bathroom was the classic black and white tile. We didn't like the light fixtures (in the second picture you can see them - a plastic tube on the wall and a gold thing on the ceiling), the cabinet above the toilet (purchased from Sears in the 1960s in case you wondered), the medicine cabinet mirror, and all the white in the room. 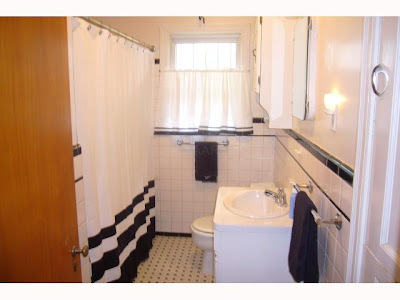 The realtor's picture of the bathroom, from MLS. My excellent photography skills documenting the prior light fixtures in the bathroom. Tyson decided to be a model that day. This is HIS bathroom, after all. Here you can see our new light fixture. We got two of these, one for each bathroom, from Home Depot's contractor series line for 24$ each. Compared to other brushed nickel finished bathroom vanity lights with white frosted glass, we saved about 30$ doing the contractor line. Also in this picture you can see that we took the medicine cabinet out and replaced it with a regular mirror, black framed to match the tile. It was $16 from TJ Maxx... And behind it is still the hole from the medicine cabinet but luckily we have a brother with carpentry skills who needs some fast cash! I've learned it is very hard to get a good picture of a light fixture. I don't like to take pictures with the flash and yet if you turn the light off to get a picture of the fixture, it is too dark... Also to the right in this picture you can sort of see the entrance to Tyson's apartment. He jumps in through the hamper door. Here's Tyson, modelling again in his new bathroom.